TheSkimm, a newsletter launched in 2012 by Danielle Weisberg and Carly Zakin, has expanded into the app world. 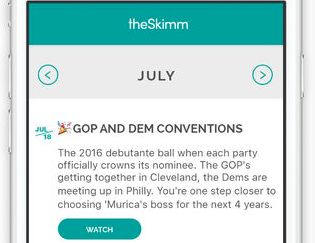 Available on iPhones, theSkimm app has one central feature: Skimm Ahead. Skimm Ahead incorporates important, upcoming events into a calendar on the app or into the iPhone calendar. The service is free for 30 days, but after that will will cost $2.99 per month.